As the only locksmith shop in Browns Plains, Brisbane, we pride ourselves on providing a much-needed and valued service at an affordable price. With a convenient mobile service as well as a shopfront, we can assist you onsite as soon as possible, so you won’t be at a loss for long. We can design and install Restricted (Do Not Copy) key systems to your requirements. If you lose your house keys, lock yourself out, need spare keys cut or need to improve the security of your home, who are you going to call? Brizsouth Locksmiths! As domestic locksmith specialists, we can provide expert assistance with all types of locks and keys, and can manipulate most types of locks. As well as cutting new keys and replacing locks, our professional team can also offer useful advice on the best kind of locks to suit your property. We will also explain how everything works if you’re installing a new locking system, so you gain full benefit from your new security system. We guarantee a quick response locksmithing service for all those emergency situations throughout Brisbane Southside, and we’ll always treat your property with due respect as if it was our own. At Brizsouth Locksmiths, we recommend that if customers have recently moved into a new home, they rekey the locks to ensure they’re the only people who have access. We can do all this at an affordable price, so for Peace of Mind in your new house – call Brizsouth Locksmiths today! BrizSouth Locksmiths is an ideal choice for affordable and reliable commercial locksmithing services throughout Brisbane Southside. Whether you need new locks for your business premises or would like replacement keys cut, we can do all this and more at our shopfront or onsite with our mobile locksmith service. Working throughout Brisbane Southside including Woolloongabba, Yatala, Ipswich, Beaudesert and all suburbs in between, our expert team works quickly, and we guarantee quality services and products for all jobs – large or small. Our experienced team can advise you on the most effective locks for your premises, and once you have chosen the best option for your premises and your budget, we will ensure all work is completed swiftly and to your satisfaction. If you are concerned about who may have access to your Brisbane premises, let Brizsouth locksmiths rekey your locks; and if you have experienced a breach in security or have concerns about your locking systems, we can install quality devices for maximum security and peace of mind. 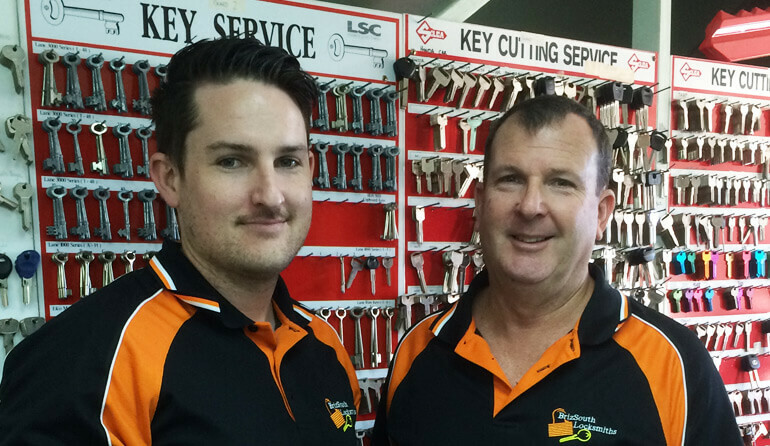 For all your Brisbane southside locksmith needs, call BrizSouth locksmiths today!